Adam and his weding bands are for hire in Hampshire. Book your band today! Whether it's the busy port life of Portsmouth, or the quieter style of island life on the Isle of Wight, your wedding deserves the best bands – and Adam Chandler can deliver. Adam Chandler wedding bands – lively or laid back, across Hampshire and the UK. Weddings are all about memories. From bringing together your individual memories, to creating new memories as a couple, memories are the meaning of a wedding ceremony. And memories are made in music. Adam Chandler can offer a range of wedding bands, from the timeless sounds of swing through to modern medleys, ballroom baroque to disco fever. All of Adam's bands bring together a wealth of professional touring and performance experience across the UK and abroad, and a fun, friendly style which will have everyone wanting to get up and dance. 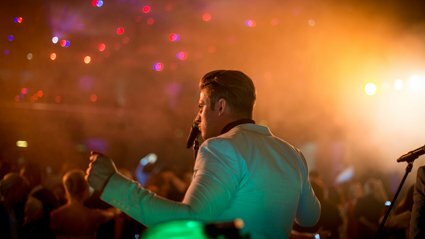 From boutique island retreats to city centre discotheques, Adam Chandler can ensure you have a band that suits your personal style, and the location, style and size of your venue. From blues and jazz to swing and contemporary dance numbers, Adam can offer a range of musical styles and performers to suit any venue, any couple, and any ambition. Whether you want subtle or strong, laid back or life and soul of the party, Adam Chandler can offer you the best band to set the seal on your wedding bands, and ensure that the taste of the food of love matches your taste in events, entertainment and enjoyment. So, from a small intimate service to a bombastic all night party, call Adam Chandler, and say "Yes" to the best selection of professional wedding bands available. Whether you want a simple four-piece band for a small family gathering, or a sixteen-piece ensemble for a large, lively celebration, Adam Chandler provide the very best in wedding entertainment, with personal dedication and attention to detail. More Wedding Bands in Hampshire! Wedding Bands available around Hampshire and beyond!